Who would have thought the ancient dead could actually break news? But that’s exactly what happened when I embarked on my hunt for Chicago’s mummies. The Art Institute of Chicago (AIC) invited me to tag along in February as they took their two mummies, Paankhenamun and Wenuhotep, to be scanned at the University of Chicago. The video below will give you a good idea of what that trip involved, and why everyone - from radiologists to Egyptologists to ambulance drivers, were fascinated by the process. The results of the scans are already coming in, and though the mummies are not currently on display, if they do go back to the galleries some relabeling will be in order - listen to the radio story above to find out why. It was news to me that the AIC even had mummies. Like The Field Museum and the Oriental Institute (OI) of the University of Chicago, the AIC got theirs toward the end of the 19th century, when people on science expeditions and tourist junkets alike became captivated with ancient Egypt. Mummies continue to—bad pun alert—walk the line between cultural object and scientific specimen. What sometimes gets lost beneath the bandages and elaborately decorated coffins is the fact that mummies were humans too. 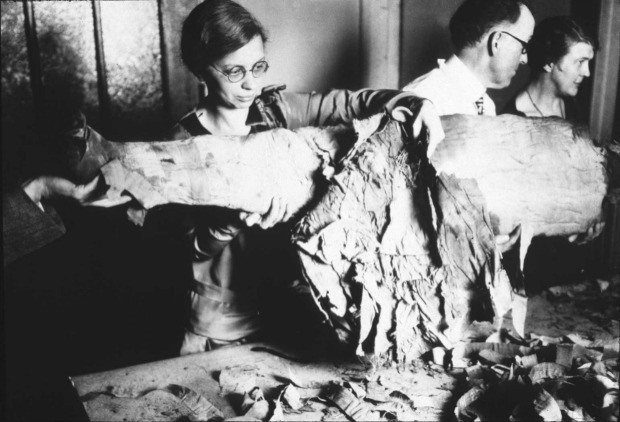 Until a few decades ago, if someone wanted to verify that fact, they would simply unwrap it - as in this somewhat ghoulish photograph of a researcher undoing the linen wrapping on one of the Oriental Institute’s mummies. I’m struck by how casual it all seems, this act that we now view as a desecration. The two people conversing in the background, the fact that the researcher’s not even wearing gloves! But many mummies were unwrapped, some by institutions and others by upper crust tourists, who thought they’d have a little fun with the souvenir they picked up on their tour of Europe. The mummy in this photograph is still at the Oriental, though it hasn’t been displayed since the 1960s or ‘70s. Oriental Institute Egyptologist Emily Teeter took me back to see her and despite being prepared, I was still startled. But now we can see inside mummies, thanks to images generated by CT scans. Scanning is the cutting edge of mummy research and exhibition, and it’s driving a new interest in the ancient dead, among the public and at institutions. Here you see the incredibly detailed views these machines allow, from a recent scan of the Field’s mummy known only as the Gilded Lady (a woman who died in her early 40s and was entombed in the early Ptolemaic period). Given Chicago’s rather large mummy population, local hospital scanners are sure to be kept busy over the coming years. The chart and map below gives you a sense of how many we have, and what the main collections include, from Peruvian mummy “bundles” at the Field, to mummy parts, including a monkey’s paw and other bits of animals at the Oriental. I haven’t verified this, but Chicago might just be the mummy capital of America. What sort of mummies are in the Field Museum&apos;s collection? What sort of mummies are in the Oriental Institute collection? Bob Martin, emeritus curator at the Field, said they are planning to re-do their permanent Egyptian collection, and include more digital elements (like a touch-screen table top display that allows you to virtually unwrap one of their mummies). The Art Institute’s mummies aren’t currently on display, though curator Mary Greuel hopes any information gleaned from the University of Chicago scans will eventually be part of an exhibition.. I also found some stray mummies. There is one in the Social Studies department at Naperville Central High School. And if you pay a visit to the Garrett-Evangelical Theological Seminary library you can view the mummy of a young girl, known as Hawara Portrait Mummy #4. Map: Where are Chicago&apos;s mummies? Do you know of any local mummies we may have missed? Let us know - we’d love to add them to our inventory!